This is a service we offer to clients who have issues that come up during the closing of a sold property or perhaps following damage from weather or woodpeckers. Even though there are different types of stuccos, i.e. 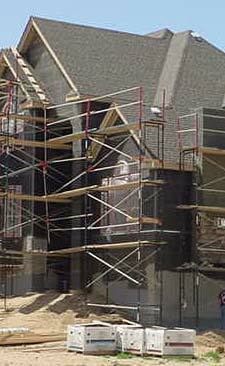 EIFS™, Hybrid™, Hard Coat™, and so on, the application method is the same to repair each of these systems. When a tornado hit Windsor and Northern Colorado in late spring a couple years ago, we found the common factor where most of the damage occurred was the stucco bands. Although they suffered the most damage, on other surface areas it was to the flat body of the stucco. Therefore, we treat the body and the bands the same. Due to our company trademarks and patents, we don’t reveal the complete application method; however, what works is applying fiber-reinforced mesh over the damaged areas to seal all cracks, create a smooth, level surface and leaves a color coat that matches the existing surface. Please note: in order to repair and match colors correctly, we must sometimes re-color one complete side or elevation of a work area or re-do all the bands to get the desired outcome. We offer over 5,000 colors for you to choose from. See our material gallery for samples and textures. Sometimes a repair is a great way to give your home or business a facelift! Larger repairs that require more than one (1) day to complete will be charged by the square foot. All prices are subject to change due to location of repair and any unusual circumstances: distance, height, demo, and so on. Please call our office at (970) 346-1350 for more exact pricing.